Another model is proudly showing off a colostomy bag. Since he was a teenager, the British man dreamed of making a career out of training and nutrition. But that dream was put into question in 2003 when he was diagnosed with ulcerative colitis, a form of chronic bowel disease that causes rectal bleeding, weight loss and fatigue, among other debilitating symptoms, according to Beckford's website. After a decade of taking multitudes of pills, the situation only worsened — leaving Beckford chained to a restroom where he would have to go sometimes up to 15 times a day. That's when he to underwent an ileostomy — a procedure that would require him to rely on colostomy bags to flush out his waste. While recovering, he was dealt another blow. Doctors told him that he would likely never be able to train seriously again. "When you go through the surgery some say you grieve," Beckford wrote on his website. "I didn't grieve because I had a bag but I did after I was told I would be very unlikely to achieve the fitness goals I had always aspired to. Hearing this after having surgery to remove this awful disease thats held you back for all this time is incredibly hard to deal with. Beckford told Men's Fitness he continued to train, slowly at first, to build up his strength. Beckford started doing pilates and yoga to develop his core strength and give him a little strength and robustness before going back to the gym. Conscious of the fact that he could damage his intestine very easily, he bought a hernia belt and a mouldable cup to place over his stoma for protection....From this gentle start, Beckford's fitness went from strength to strength, and his body started to take shape. It's virtually unheard of for someone who has undergone an ileostomy to get into the kind of shape Beckford wanted, but that didn't deter him. "The problem is that with any kind of big movement, such as a deadlift or squat, everything goes into the core, and that pressure needs to go somewhere. So it will try to push out the abdominal muscle where the weakness is, and the bowel will herniate," he told Men's Fitness. 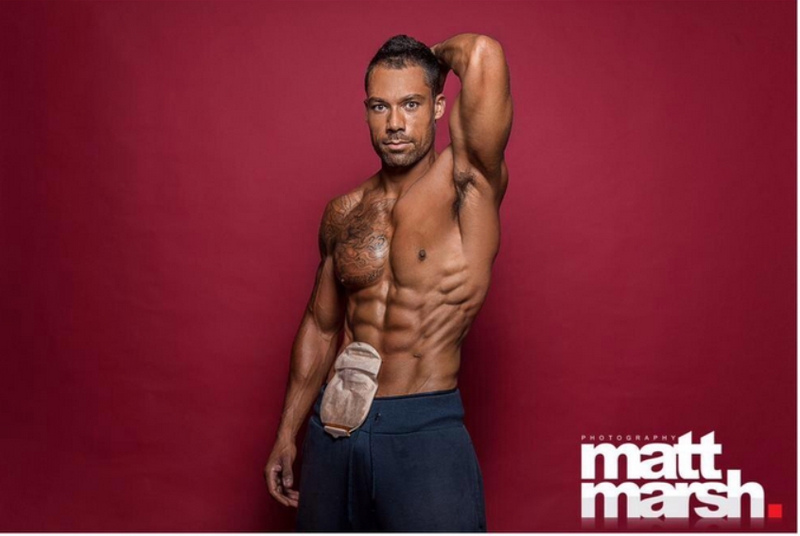 Beckford wants to let everyone know that a colostomy bag isn't anything to be ashamed of. "I am determined to show people and society that having a stoma doesn't change who you are. It doesn't mean you're not normal," he said. "It means you can achieve anything you want to do, you can be attractive, and you can lead a normal life." Images via Blake Beckford Twitter.